වෙන කේස් එකකට ඥාණසාර හිමි නැවත රිමාන්ඞ්..
අධිකරණය අපහාස කිරීමේ චෝදනා මත රිමාන්ඞ් කර සිට අද දිනයේ ඇප නියම වූ බොදු බල සේනා සංවිධානයේ මහ ලේකම් පූජ්‍ය ගලගොඩඅත්තේ ඥාණසාර හිමියන් හෙට දිනය දක්වා යලි රිමාන්ඞ් කර තිබේ. 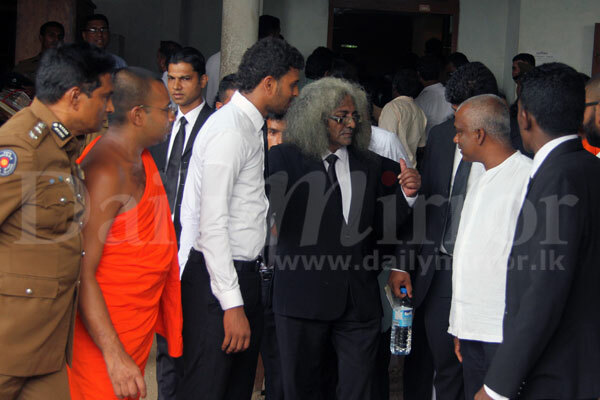 ඊට හේතු වී ඇත්තේ ප්‍රගීත් එක්නැළිගෙඩ මහතාගේ බිරිඳට තර්ජනය කලේ යයි එල්ල වන චෝදනාවයි. 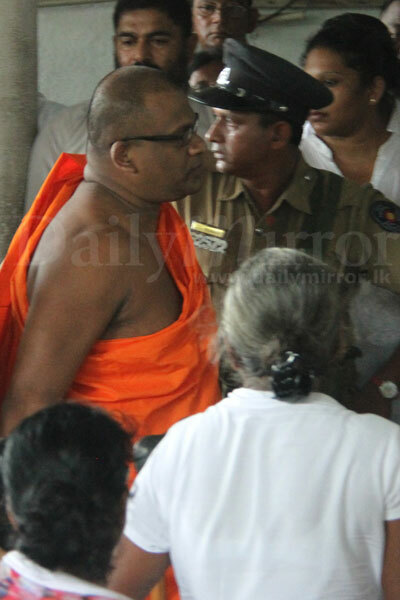 Bodu Bala Sena (BBS) General Secretary Ven. 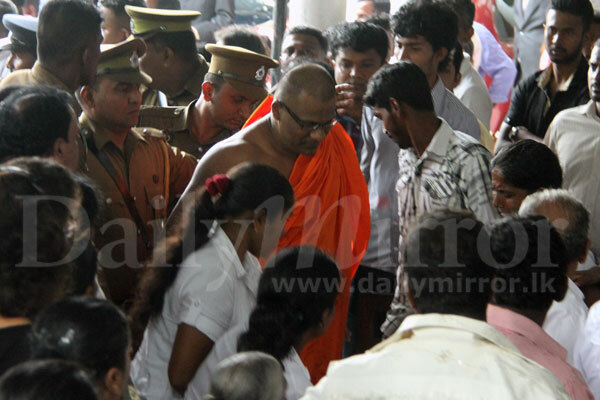 Galagodaatte Gnanasara Thera, who was granted bail by the Homagama Magistrate in the Contempt of Court case, was further remanded until tomorrow (10) for allegedly threatening Sandhaya Eknaligoda. යුද සමයේ දී උතුරේ අවතැන් වූ මුස්ලිම් ජනාතාව නැවත පදිංචි කිරීම කඩිනම් කරන ලෙස ඉල්ලමින් උතුරේ මුස්ලිම් වරුන්ගේ අයිතිවාසිකම් පිළිබඳ සංවිධානය අද කොළඹ මෙරට එක්සත් ජාතීන්ගේ නේවාසික කාර්යයාල මූලස්ථානය ඉදිරිපිට නිහඬ විරෝධතාවයක නිරත විය. සිය ඉල්ලීම් සඳහන් සංදේශයක් නියෝජිතයන් මගින් එක්සත් ජාතීන්ගේ මානව හිමිකම් මහකොමසාරිස් සෙයිද් අල් හුසේන් මහතාට භාර දුන්නේය. උසාවියට අපහස කළැයි කියන සිද්ධියක් සම්බන්ධයෙන් රිමාන්ඩ් බාරයේ සිටින බොදු බල සේනාවේ මහ ලේකම් ගලගොඩඅත්තේ ඥානසාර හිමි අද (09) හෝමාගම උසාවියට රැගෙන ඒමට නියමිතය. උසාවිය අවට දැඩි පොලිස් ආරක්ෂාවක් යොදවා ඇති අතර උසාවියට පිවිසෙන ප්‍රධාන මාර්ග 2ක් වසා ඇත. අතුරු මාර්ගවලද ආරක්ෂාව තර කර ඇත. නඩු කටයුත්තකට හැර කිසිවෙකුට උසාවි භූමියට ඇතුළු වීමට නොහැක. ජල ප්‍රහාරක රථ, කැරලි මර්දන රථ ද රඳවා ඇත. උසාවියට අපහාස වන සේ උසාවි භූමියේ හැසිරුණු බව කියන සිව්දෙනකු හඳුනාගැනීමේ පෙරට්ටුවකට ඉදිරිපත් කිරීම සඳහා අධිකරණ භූමියට රැගෙන එනු ලැබ සිටිති. ගලගොඩ අත්තේ ඥානසාර හිමි අද පස්වරු 1 ට බන්ධනාගාර රියෙන් හෝමාගම උසාවියට ගෙන එනු ලැබීය. උසාවියට අපහාස කිරීමේ නඩුවෙන් ගලගොඩඅත්තේ ඥානසාර හිමියන්ට ඇප දුන් නමුත් සන්ධ්‍යා එක්නැලිගොඩට තර්ජනය කළැයි කියන සිද්ධිය සම්බන්ධයෙන් ඥානසාර හිමියන් බදාදා (10) දක්වා හෝමාගම මහේස්ත්‍රාත් රංග දිසානායක මහතා විසින් රිමාන්ඩ් කරනු ලැබීය. ඥානසාර හිමියනට ඇප දිය හැකිදැයි බදාදා සළකා බලන බව මහේස්ත්‍රාත් ප්‍රකාශ කළේය. රිමාන්ඩ් කිරීමෙන් පසු ඥානසාර හිමියන් බන්ධනාගාර රියට ගොඩවූයේ ‘සබ්බේ සත්ථා භවන්තු සුඛිතත්ථා‘ යන ගාථා පාඨය කියමිනි. Former President Mahinda Rajapaksa’s wife Shiranthi has been asked to report to the Presidential Commission of Inquiry (PRECIFAC) tomorrow to obtain a statement on an order made by her to the National Housing Development Authority (NHDA) directing it to allocate a house to one of her media officers at a valuation far below the market value. The estimated value of the house in Kahathuduwa is Rs.5.5 million but it had been grossly undervalued at Rs.500, 000. හිටපු ජනපති මහින්ද රාජපක්ෂ ගේ බිරිය වන ශිරන්ති රාජපක්ෂ අද (01) බරපතල වංචා දූෂණ ජනපති කොමිසමට කැඳවනු ලැබ සිටියාය. පාර්ලිමේන්තු මන්ත්‍රී නාමල් රාජපක්ෂ මහතාද එහි පැමිණ සිටියේය. Yoshitha Rajapaksa among four detained after long probe into alleged financial offences linked to TV station. 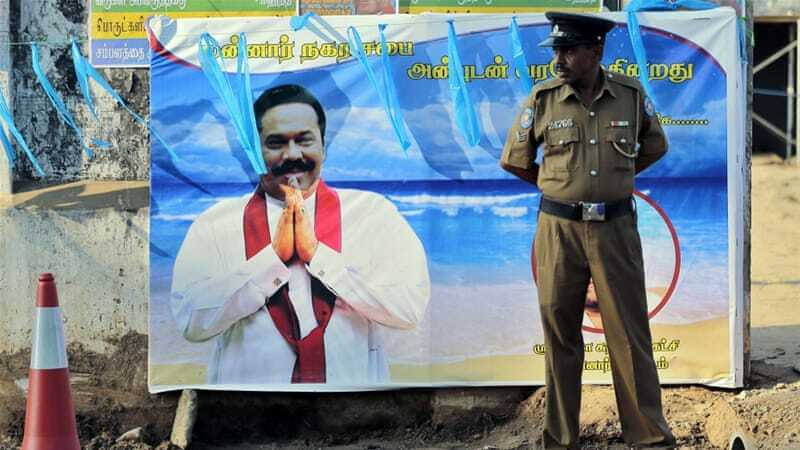 Sri Lankan authorities have arrested a son of the country's former president Mahinda Rajapaksa on a charge of money laundering, officials have said. 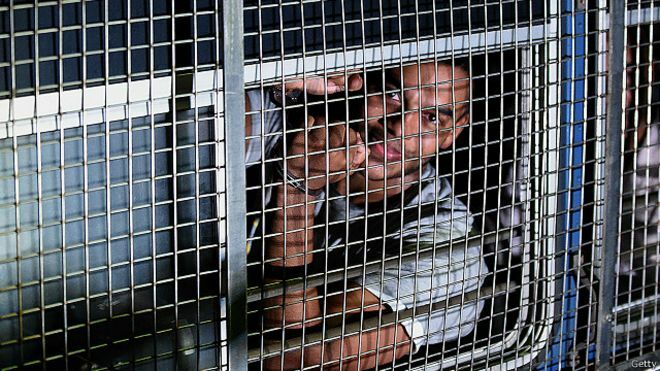 Yoshitha Rajapaksa, a navy officer, was detained on Saturday following months of investigations into alleged financial irregularities linked to his private television channel Carlton Sports Network (CSN), police said. 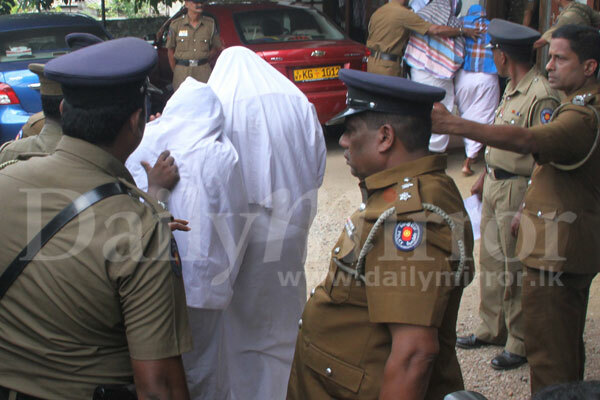 A court official said he was taken before a magistrate court in a suburb of the capital Colombo and remanded for two weeks. 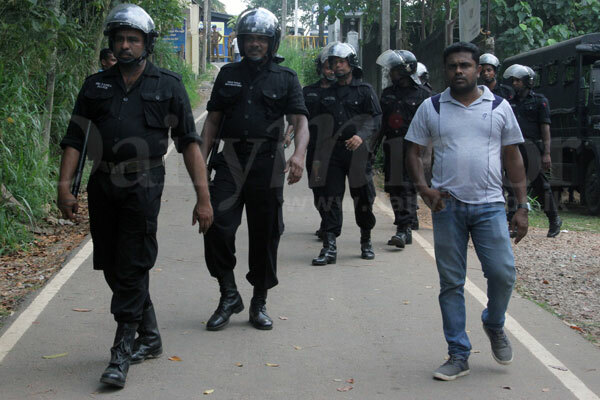 He was among four arrested, including the CNS Chairman Rohan Weliwita and Nishantha Ranatunga, a younger brother of Sri Lanka's prominent cricket captain Arjuna Ranatunga, local news reported. Nisantha Ranatunga had been the chief executive of the CSN channel that secured broadcasting rights for all cricket matches. The CSN station is accused of illegally using government equipment and vehicles for its daily operations and failing to pay billions of Sri Lankan rupees in taxes. 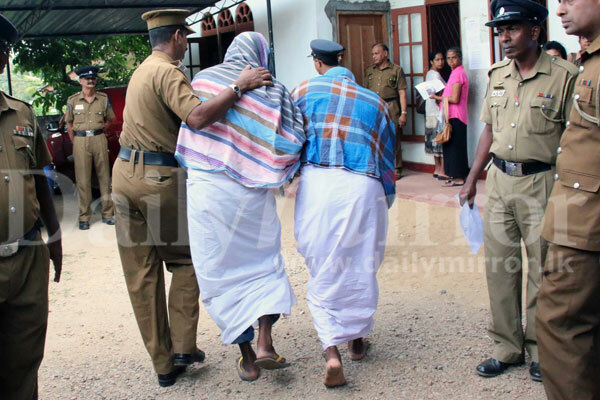 Yoshitha is the second relative of of former president Mahinda to be arrested for alleged offenses committed during his presidency. A brother, who was a former government minister, was arrested in April last year and charged with misappropriating state funds. Basil Rajapaksa, a former economic development minister, was arrested along with two senior officials who worked under him on charges related to fraud involving the construction of public housing. 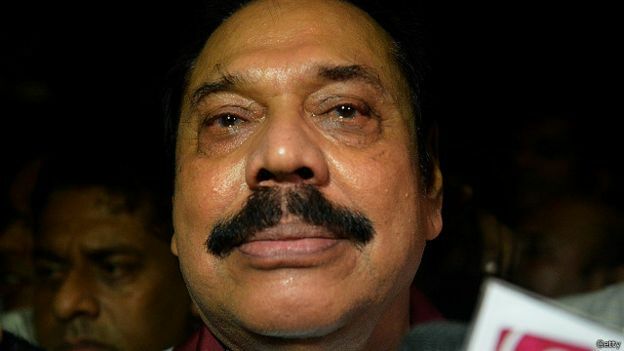 Mahinda, who lost the election last year, has accused the new government of leading a witch hunt targeting his family. Members of the Rajapaksa family had controlled nearly 70 percent of Sri Lanka's national budget during the former president's rule. 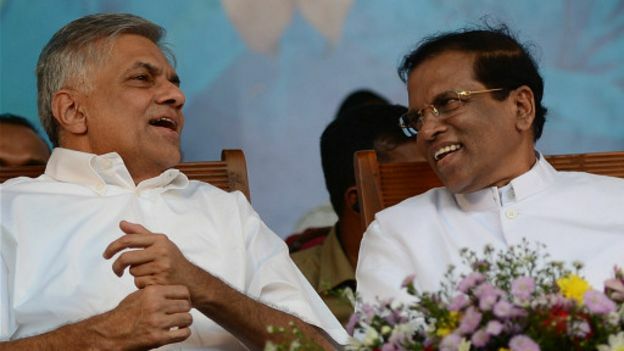 Maithripala Sirisena, the country's current president, has vowed to investigate allegations that members of Rajapaksa's family siphoned off billions of dollars from the country during his nearly 10-year rule. සිය පුතකු අත්අඩංගුවට ගනු ලැබීම දේශපාලන පළිගැනීමක් ලෙස හිටපු ජනපති මහින්ද රාජපක්ෂ හඳුන්වන නමුත් යෝෂිත රාජපක්ෂ සීඑස්එන් සමාගමේ සභාපතිවරයා බව පැහැදිලි ලෙස අනාවරණය වී ඇතැයි පොලිසිය පවසයි. මහින්ද රාජපක්ෂ හිටපු ජනපතිවරයාගේ පුතුන් සීඑස්එන් සමාගමේ ප්‍රධානීන් නොවන බවට නාමල් රාජපක්ෂ මන්ත්‍රීවරයා සහ හිටපු ප්‍රධාන විධායක නිලධාරි නිශාන්ත රණතුංග දිගින් දිගටම අවධාරණය කළත්, යෝෂිත රාජපක්ෂ සමාගමේ සභාපතිවරයා වශයෙන් තීන්දු තීරණ ගත් බවට සාක්ෂි ලැබී තිබෙන බවයි පොලිසිය පවසන්නේ. යෝෂිත රාජපක්ෂ, නිශාන්ත රණතුංග ඇතුළු පිරිසක් සෙනසුරාදා අත්අඩංගුවට ගෙන අධිකරණයට ඉදිරිපත් කිරීම පිළිබඳ කරුණු දක්වමින් පොලිස් මාධ්‍ය ප්‍රකාශක සහකාර පොලිස් අධිකාරී රුවන් ගුණසේකර ඉරිදා නිකුත් කළ නිවේදනයකයි, ඒ බව සඳහන් වෙන්නේ. සීඑස්එන් සමාගමට ප්‍රාග්ධනය වශයෙන් රුපියල් ලක්ෂ 2340 ක් යොදවා තිබූ අතර සමාගමේ කොටස් නිකුතුවෙන් ලැබී තිබුණේ රුපියල් ලක්ෂ 70 ක් පමණක් යැයි විමර්ශනයේදී අනාවරණය වූ බවයි පොලිසිය පවසන්නේ. ඉතිරි ප්‍රාග්ධන මුදල් ලබාගත් ආකාරය සොයා බැලීමේදී ඒවා ව්‍යාජ ගනුදෙනු සහ විදේශ රාජ්‍යයක සිට නීත්‍යනුකූල නොවන ආකාරයෙන් උපයා ගනු ලැබූ මුදල් බව හෙළි වූ බවත් පොලිස් නිවේදනයේ සඳහන්. එමෙන්ම සමාගමට මුදල් ලැබුණු ආකාරය සම්බන්ධයෙන් සමාගම හෙළි කරන තොරතුරු විශ්වසනීය නොවන තත්වයක් යටතේ සමාගමේ ප්‍රාග්ධනය මුදල් විශුද්ධිකරණයෙන් ලබාගත් මුදල් බව පොලිස් විමර්ශකයන්ගේ නිගමනය වී ඇත. අදාළ චෝදනා සම්බන්ධයෙන් සාක්ෂිකරුවන්ගෙන් කරුණු විමසීමේදී ඔවුන් එම චෝදනාවලට නිවැරදිකරුවන් යයි අනාවරණය වී නොමැති බැවින්, නීති විධිවිධාන ප්‍රකාර ඔවුන් අත්අඩංගුවට ගෙන අධිකරණය වෙත ඉදිරිපත් කළ බවයි පොලිසිය පවසන්නේ. මුදල් විශුද්ධිකරණයට අමතරව කූට ලේඛන සැකසීම, සාපරාධී විශ්වාසය කඩකිරීම, සාපරාධී සාවද්‍ය පරිහරණය, රේගු පනත උල්ලංඝනය කිරීම ඇතුළු චෝදනා ගණනාවක් මෙන්ම රාජ්‍ය දේපොළ අවභාවිතය සම්බන්ධ චෝදනාත් විත්තිකරුවන්ට එරෙහිව එල්ල වී තිබෙන බවත් පොලිස් මාධ්‍ය ප්‍රකාශකවරයාගේ නිවේදනයේ වැඩිදුරටත් සඳහන්. අන්තවාදී සංවිධාන යොදා ගෙන රට තුල ජාතිවාදී කලබල ඇති කිරීමට කලින් බලයේ සිටි ආණ්ඩුවේ ප්‍රබල පුද්ගලයන් කටයුතු කරමින් ඇති බවට රාජ්‍ය බුද්ධි අංශවලට තොරතුරු ලැබී ඇති බව සෞඛ්‍යය ඇමති, සම කැබිනට් ප්‍රකාශක රාජිත සේනාරත්න පවසයි. ඇමතිවරයා එම ප්‍රකාශය කළේ කැබිනට් තීරණ දැනුම්දීමේ මාධ්‍ය හමුවේ දී අදහස් දක්වමිනි. ‘අන්තවාදී සංවිධානවලට මුදල් දී ජාතිවාදී කලබල ඇති කර රට තුළ නොසන්සුන්භාවයක් ඇති කිරීමට හිටපු රජයේ ප්‍රබලයන් සුදානම් වන බව බුද්ධි අංශ විසින් රජයට වාර්තා කර ඇති’ බව අමාත්‍ය රාජිත සේනාරත්න විසින් අනාවරණය කරනු ලැබුණේ ‘සිංහලේ’ ව්‍යාපාරය ගැන මතු කෙරුණ ප්‍රශ්නයකට පිළිතුරු දෙමිනි. ‘ජනාධිපතිවරයා මේ ගැන කැබිනට් මණ්ඩලයට ප්‍රකාශ කළා. 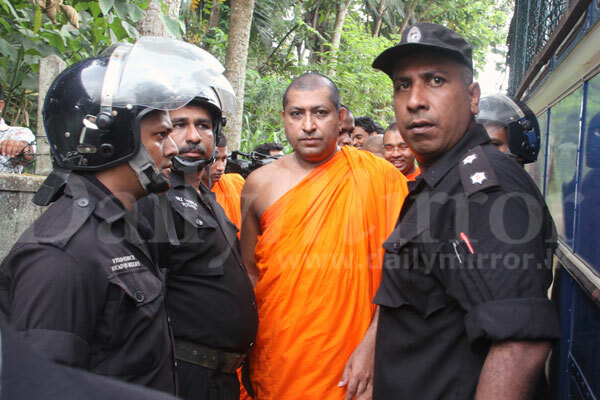 මේවා පිටු පස්සේ ඉන්නේ එක්තරා කණ්ඩායමක්. රාජපක්ෂ රෙජීමය තමයි මේවාට මුදල් දීලා ඔක්කොම කරන්නේ. මේවා උවමනාවෙන්ම සිදු කරන්නේ රට නොසන්සුන් තත්වයකට පත් කරන්න. මේවා පිටු පස්සේ ඉන්න අය සහ ඒවාට මුදල් ලැබෙන ආකාරය ගැන රහස් පරීක්ෂණ වාර්තා වලින් රජයට තොරතුරු ලැබිලා තියෙනවා’ රාජිත සේනාරත්න ඇමතිවරයා පවසයි. අදාළ නීති අංශ එම තත්වය සම්බන්ධයෙන් දැඩි ලෙස ක්‍රියා කරනු ඇති බවත් ඇමතිවරයා කියා සිටියි. මෙවර නිදහස් දින සැමරුමේ දී ශ්‍රී ලංකා ජාතික ගීය සිංහල හා දෙමළ යන භාෂා දෙකෙන් ම ගායනා කළ යුතු බවට යෝජනාවක් ඊයේ (27) කැබිනට් මණ්ඩලයට ඉදිරිපත් වූ බවත් රාජිත සේනාරත්න අමාත්‍යවරයා සඳහන් කළේය. ‘ශ්‍රී ලංකා අනන්‍යතාවයක් ගොඩනැගීම ගැන කැබිනට් අනුකාරක සභාවක් පත් කරලා තියෙනවා. එම අනුකාරක සභාවෙන් ඉදිරිපත් කරපු එක් යෝජනාවක් තමයි ජාතික ගීය සිංහලෙන් හා දෙමළෙන් මෙවර ජාතික නිදහස් උත්සවයේ දී ගායනා කල යුතු ය කියන එක. ජනාධිපතිතුමා සහ අගමැතිතුමා අතර සාකච්ඡාවකින් ඒ ගැන තීන්දුවක් ගැනීමට තීරණය කළා’ ඇමති රාජිත සේනාරත්න පවසයි. කැබිනට් තීරණ දැනුම්දීමේ මාධ්‍ය හමුවේ දී අවධානය යොමු වූ තවත් කරුණක් වූයේ ශ්‍රී ලංකාවේ සිදු වී යයි පැවසෙන යුද අපරාධ සම්බන්ධයෙන් සිදු කෙරෙන පරීක්ෂණ පිළිබඳවයි. පසුගිය දා බීබීසිය සමග සාකච්ඡාවකට එක් වූ ජනාධිපති මෛත්‍රිපාල සිරිසේන එම පරීක්ෂණ ජාත්‍යන්තරයේ මැදිහත් වීමකින් තොරව සම්පුර්ණ දේශීය යන්ත්‍රණයකින් පවත්වන බවට ප්‍රකාශ කල අතර අගමැති රනිල් වික්‍රමසිංහ ‘චැනල් 4’ බ්‍රිතාන්‍ය රූපවාහිනියට කියා තිබුණේ එම පරීක්ෂණ සඳහා ජාත්‍යන්තර මැදිහත් වීම බැහැර නොකරන බවයි. 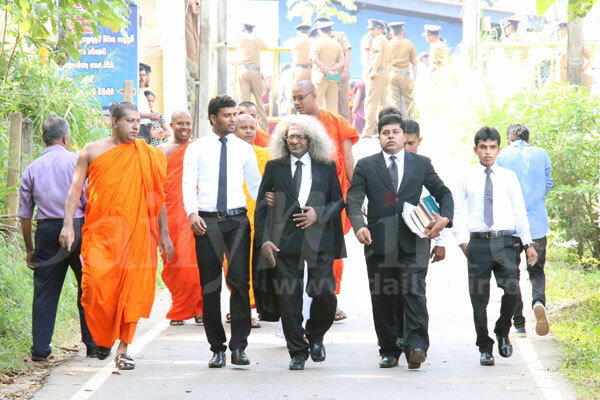 එම ප්‍රකාශන අන්‍යෝන්‍ය වශයෙන් පරස්පර නොවේදැයි මාධ්‍යවේදීන් ප්‍රශ්න කළ විට රාජිත සේනාරත්න ඇමතිවරයා කියා සිටියේ ‘සම්පූර්ණ පරීක්ෂණය දේශීය’ එකක් වන බවයි. ‘අපේ ස්ථාවරය තමයි සම්පුර්ණ පරීක්ෂණය දේශීය පරීක්ෂණයක් වීම.අගමැතිතුමා කිව්වෙත් ඒකයි. විනිසකරුවන් ශ්‍රී ලංකාවෙන්. හැබැයි පිටරට තාක්ෂණය වගේ දේවල් යොදා ගන්න පුළුවන්’ එක්සත් ජාතීන්ගේ සංවිධානය පවසා තිබෙන්නේ ඔවුන්ට පිළිගත හැකි සාධාරණ විනිශ්චය මණ්ඩලයක් පත් කරන ලෙස යයි සඳහන් කළ රාජිත සේනාරත්න ඇමතිවරයා ඒ සඳහා ලෝකය පිළිගත් ශ්‍රී ලංකික විනිසුරුවරුන් වන විනිසුරු විරමන්ත්‍රි වැනි අය පත් කල හැකි බවයි පෙන්වා දුන්නේ. යුද සමයේ ශ්‍රී ලංකාවේ සිදු විනැයි කියන අපරාධ පිලිබඳ පරීක්ෂණ යාන්ත්‍රණය මැයි මාසය වන විට සකස් කිරීමට හැකි වනු ඇති බව අගමැති රනිල් වික්‍රමසිංහ ප්‍රකාශ කර ඇත. 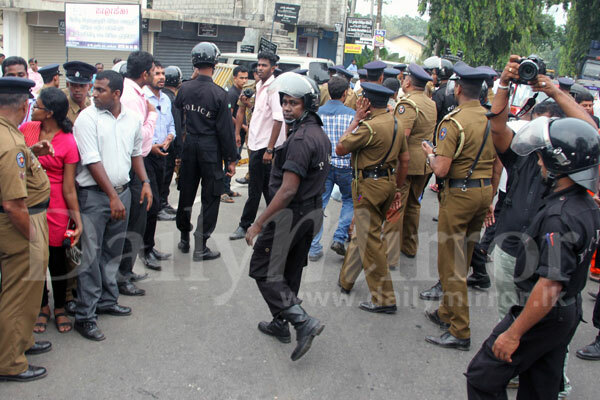 Three persons were arrested by police over the protests near Homagama Magistrate's Court on January 26. They include a three wheeler driver and two other individuals. 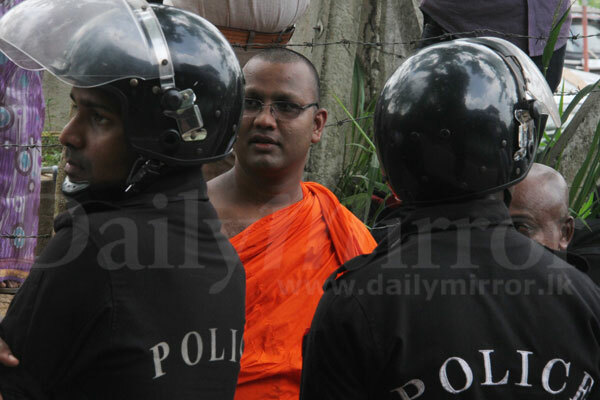 A tense situation erupted on January 26 at the Magistrate's Court when Bodu Bala Sena General Secretary Galagodaatte Gnanasara Thera was remanded till February 9 on three charges. 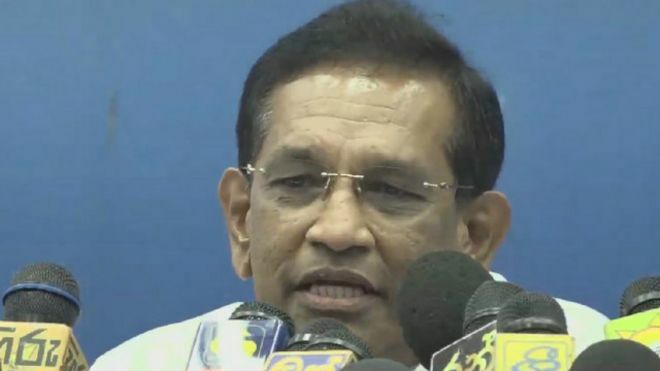 Cabinet Spokesman minister Rajitha Senarathna says that the government has drawn its attention to the necessity to recite the National Anthem in Sinhala and Tamil as part of the Independence Day celebrations this year. The remark was made during a media conference held today. In response to being questioned by a journalist who inquired about a statement made by the Prime Minister during an interview with UKs channel 4, minister Raajitha Senarathna responded that the former president Mahinda Rajapaksa’s name has still not been included in the list of names of those who have maintained foreign bank accounts.